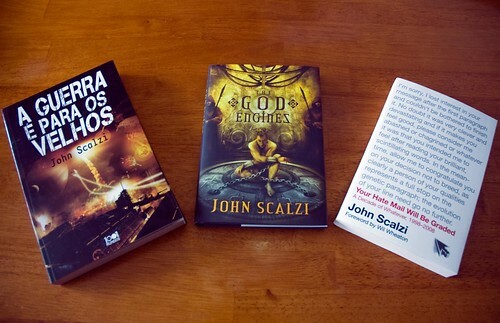 From the left: The Portuguese edition of Old Man’s War, the physical copy of The God Engines, and the Tor trade paperback edition of Your Hate Mail Will Be Graded. The first of these is out already; the latter two are imminent — TGE is shipping by the end of the year, and Hate Mail is scheduled for January 5th (which means a few might have already leaked to stores). They all look great. I love the new Hate Mail cover (not that I didn’t like the one with me as a devil on it, it’s just that this one is probably better for a mass market), and The God Engines is simply the coolest-looking book I’ve had so far, thanks to Vincent Chong’s awesome cover and interior art (some of which you can see on the SubPress order page for the book). Really, it’s like Christmas came early around here. By, uh, three days or something. Scalzi somehow manages in a mere 136 pages to create believable, like-able characters who exist in a world that, while fantastic…is both wonderful and convincing. Short but potent. I’ll take that. Want a Big Idea that’s about a really big idea? Well, this week’s book is about quantum physics, and it doesn’t get much bigger than that (well, given the scale quantum physics works on, it actually doesn’t get much smaller than that, but you know what I mean — it’s a really big idea about really small things). Just the words “quantum physics” makes some people itchy, and don’t think author Chad Orzel doesn’t know it — he teaches physics for a living as a professor at Union College. But to show the subject is not as intimidating as all that, Orzel proposes to show that even our canine friends can follow the subject — and use it to their advantage when, say, chasing squirrels. Thus: How to Teach Physics to Your Dog, featuring Orzel and his dog Emmy discussing Particle-Wave Duality, the Heisenberg Uncertainty Principle, the Many-Worlds Interpretation and other very cool ideas in quantum physics. Does it work? It does indeed; this is a great book for folks who are interested in science and physics, whatever their previous level of knowledge on the subject (that’s a hint for you last-minute Christmas shoppers). I personally liked the book enough to give it a blurb; I’m a big fan of books that make science understandable for everyone, and Orzel (and Emmy) have just the right touch for that. This is a fun and fascinating book. All of this leaves unanswered the question: “Why would a person think to teach physics to his dog in the first place”? Here’s Orzel to explain. There’s an old saying that you never really understand a subject until you try to teach it to someone else. It turns out that the best way to understand quantum mechanics is to teach it to your dog. The big idea at the heart of the book is “Quantum mechanics is just about the coolest thing ever.” Because, really, it is– you’ve got particles that behave like waves and vice versa; objects whose properties aren’t determined until they’re measured; even “virtual particles” that pop into existence from empty space, and disappear again in a fleeting instant. What could be cooler than that? It’s even weirder than science fiction– if you had tried to sell modern physics to a pulp magazine in the early 20th century, they’d have laughed at you. And yet, quantum mechanics is one of the best-tested theories in the history of science. All of these bizarre phenomena are experimentally verified, to something like 14 decimal places. And quantum physics is not just some abstract idea with no practical implications. Quantum ideas are the basis for most of the coolest things in modern life. You wouldn’t be able to read this without quantum physics: the modern telecommunications networks that form the backbone of the Internet use diode lasers, which rely on the quantum nature of light and matter to operate. Even the computer you’re (presumably) reading this on would not be possible without a detailed understanding of the quantum physics of electrons inside solids, and how they can be manipulated to make silicon computer chips. Of course, “Quantum mechanics is just about the coolest thing ever” is not, by itself, enough to make a book. If you want to write a new book on the subject, you need a hook to grab people who wouldn’t ordinarily read a book about physics. In my case, the hook is a talking dog. My dog Emmy, to be precise, whose interest in quantum mechanics and its potential use in catching squirrels and bunnies is the jumping-off point for explaining the theory. Each chapter opens with a conversation between me and Emmy about some aspect of quantum physics, followed by a more detailed explanation of the physics for interested humans (and dogs). I’d like to be able to say that the whole talking-to-the-dog-about-physics thing was a carefully calculated move to bring physics to a general audience. In reality, it was a total accident– I wrote a couple of talking-to-the-dog blog posts (Bunnies Made of Cheese and Many Worlds, Many Treats), and they were a big hit. The book just sort of happened after that. Once I started, though, it became clear that dogs and quantum physics are a great fit. Anyone who owns a dog knows that they approach the world as an endless source of surprise and wonder, and readily accept many things that would drive humans nuts. If you’ve ever watched a dog staring intently at nothing, you know that the idea of “virtual particles” will be no problem for a dog. If dog treats appeared out of nothing in the middle of our kitchen, Emmy would take it as vindication (and you can be sure she would see to it that they vanished very quickly). Quantum indeterminacy is not a problem for a dog, as they never believe anything really exists until they’ve sniffed it thoroughly. And surely it’s easier to get your head around the idea of particles that are also waves than it is to figure out what cats are up to. So, quantum physics is a natural fit with the canine mindset. And that turns out to be a great way to explain quantum physics to a human audience. People can relate to Emmy’s schemes to turn quantum physics to her advantage, and that provides an easy way to make a connection to even the weirdest ideas of quantum physics. If you can manage to think like a dog, it’s not that big a leap to an appreciation of the weird and wonderful quantum world. Emmy’s voice is also a huge help in keeping the text moving. Whenever the explanations start to get a little thick (and they do, because quantum mechanics is heavy stuff), Emmy breaks in to ask for clarification, or express a key idea a different way, or just comment ironically on the density of the explanation. It’s a great way to keep the material from overwhelming the reader. This was a fun book to write, especially the dog bits. And I certainly know a lot more about quantum mechanics than I did before I decided to try to teach it to my dog. I hope that humans reading it will enjoy it, and maybe learn some new science that they can teach to their own dogs. Visit DogPhysics.com, the official Web site for the book. Read a preview of the book and watch videos about the book. Learn more about Emmy, the physics-learning dog, and follow her on Twitter. You can follow Chad Orzel on Twitter, as well.